Dark Horse Comics is proud to announce that Rafael Albuquerque and Mike Johnson’s critically acclaimed EI8HT #1 has sold out at the Diamond level and gone to a second printing. Welcome to the Meld, an inhospitable dimension in time where Joshua, a chrononaut, finds himself trapped. With no memory or feedback from the team of scientists that sent him, he can’t count on anything but his heart and a stranger’s voice to guide him to his destiny. The past is green, the present is purple, the future is blue—but the Meld is something else entirely. Emphasizing the incredible concept of the Meld, the second-printing cover by Rafael Albuquerque invites readers to experience a new adventure. Find out why fans and critics are traveling in droves to the Meld. 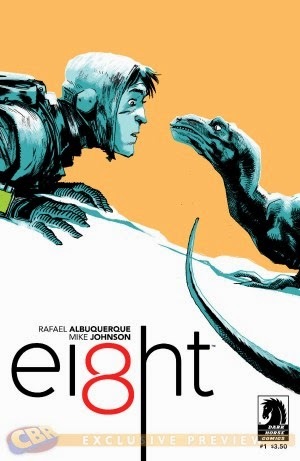 Order your second printing of EI8HT #1 today from your local comics retailer! Check out the full second printing cover at Comic Book Resources!